Welcome to the online home of Janet Eoff Berend, a high school English teacher, drummer in a rock band, and author of Young Adult fiction. Two of Janet’s novels, Vertical and True Vert have been published by Breakaway Books, a publishing house in New York that specializes in sports-related fiction and nonfiction. Currently Janet is working on her third novel, which also takes place in a high school setting, but is completely unrelated to her first two books. Janet finds time to write whenever she can. In between teaching literature at La Costa Canyon High School, spending time with her husband, daughter, and son, doing the dishes, walking the dog, or rehearsing with her band, Super Nacho, sometimes Janet finds herself writing a scene at 4 am in the morning. When her characters speak, Janet listens, and the students who pass through her classroom door are a constant source of inspiration. 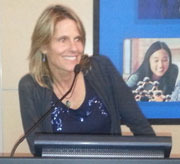 Janet has been invited to talk to teen writers about the craft of writing fiction. Janet will be a panelist discussing Young Adult literature at the inaugural San Diego Festival of Books, hosted by the San Diego Union Tribune. Hey Janet! What’s Vertical about? Vertical tells the story of 14-year-old skateboarder, Josh Lowman. When Josh witnesses Lenny, one of the best skateboarders in town, commit a life threatening crime, Josh’s world gets turned upside down. If he snitches on Lenny, Josh’s best friend will disown him, but if he keeps his mouth shut, who will be Lenny’s next victim? Friendships with a fellow skater, a girl in his English class, and a cool math tutor (a college student who skates) help Josh discover that just like dropping in on the vertical walls of skate ramps, sometimes being a true friend takes guts. And what about True Vert? In True Vert, the sequel to Vertical, Josh is obsessed with becoming a sponsored skater. He pushes the limits of what’s humanly possible on a skateboard, but he starts to lose focus on the things that truly matter. His goal is to impress Erin, but he’s so caught up in becoming the next big thing that Erin and the rest of his old friends don’t want to be around him. And he’s not sure if his new friends are even friends at all. In True Vert Josh is forced to make tough decisions about what he’s willing to risk in order to chase his dreams. Trust me. Vertical and True Vert will keep you turning the page. Janet’s newest novel, True Vert, will be on display as part of the San Diego Public Library’s Local Author Program. Take a look at True Vert, along with other fabulous books written by San Diego authors. Meet and greet with local authors, including Janet. Great for English teachers and literature fans alike! Register here. Janet will be signing copies of True Vert as part of Warwick’s Weekends with Locals series. Janet will be participating in a small discussion along with a panel of featured authors as part of the Encinitas Barnes & Noble 20th Anniversary Weekend. She will also be signing copies of True Vert. 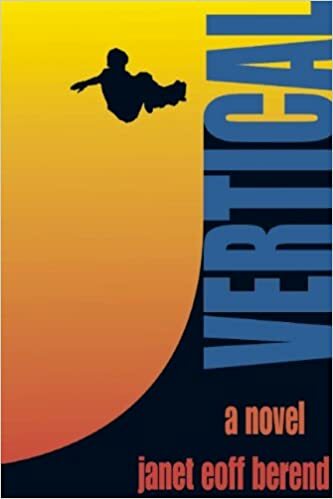 View Janet’s book trailer below to learn more about her first book: Vertical. Read an excerpt of True Vert and order it from Amazon! Check out Paul Greci’s awesome review of True Vert at Project Middle Grade Mayhem! Want to learn more about Vertical? Read the interview with Janet at the cool website From the Mixed-Up Files of . . . Middle-Grade Authors.